Introduction: The Hungarian tribes, arriving in the territory of present-day Hungary in 895 A.D., were received with a fair amount of antipathy by European public opinion. Not only were they non-Christians, but they harassed their neighbours with their marauding expeditions. Though these campaigns ceased after 955, after the defeats suffered at Augsburg and Merseburg, the Western chroniclers did not begin to depict Hungarians with more favourable hues. Usually they were referred to as Huns or Turks, and sometimes they were even considered to be Scythians, though the language of Hungarians is Finno-Ugric and not Turkic, nofr is it Iranian as is that of the Scythians. In addition, repulsive customs were attributed to them, namely that they took their oaths on dead dogs, or that they drank blood straight away. 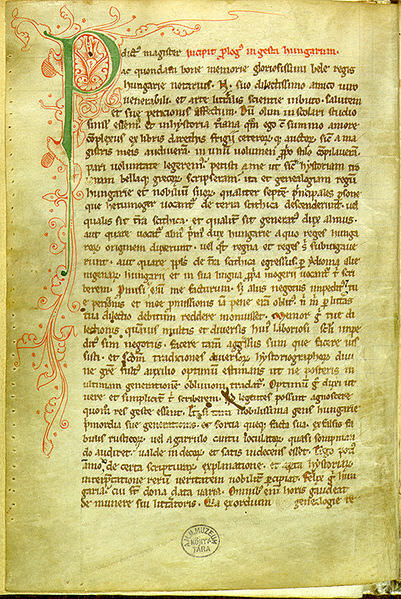 Surprisingly the very first Hungarian chronicle, the Gesta Hungarorum, originating from the 13th century and written in Latin, also mentioned the covenant of blood of the seven princely Hungarians, though not disapprovingly. I wish to investigate whether the covenant of blood was truly a specificity of Hungarians who conquered their present homeland, and from what source Anonymous, the unknown author of the Gesta got his information on that contract. Then the seven princely persons, who are called the Seven Hungarians to this day, not tolerating the limited space any longer, held council, and made efforts without delay to leave their birthplace with arms and an army, to leave their native place and to occupy such lands where they have to live. Then their choice fell on visiting the land of Pannonia. In fact they heard it from the news spread that it was the land of King Attila whose descendant was Chieftain Álmos, the father of Árpád. But the seven princely persons comprehended with joint and true intelligence that they could not reach the end of the path unless there were a leader and commander above them. Therefore the seven men elected Álmos, son of Ügyek, and the descendants of his kin to be their leader and commander of their free will and agreement for themselves, and even for the sons of their sons to the last generation, as leader Álmos, son of Ügyek, and further on those who originated from his kin, were more eminent in the matter of rank and mightier in warfare as well. In fact those seven princely persons were eminent in rank, mighty in warfare, and steadfast in fidelity. Then they told the following to leader Álmos of joint will: ‘From this day on we elect you our leader and commander and wherever your good luck takes you we will follow you’. Next, each of the above-mentioned men let their blood into a vessel for leader Álmos, in keeping with pagan custom, and sanctified their oath by it. And though they were Pagans, yet they respected their faith expressed among themselves by oath to their death the way as this oath is given here. Flórián Mátyás pointed out already in 1897 that “according to this item only six electors let their blood into the vessel; the prince only promised to accept the conditions of the oath in his and his descendants’ name. Because according to item 5 a prince who violated the oath was not to be revenged in blood on the basis of the joint blood letting involving him himself as well, but only by a curse. The narrative of the notary is deficient here, because he does not indicate what the purpose of the vessel collecting blood is. If letting blood itself is a sufficient safeguard, then the blood may flow even to the earth”. In other words, according to Anonymous narrative the seven Hungarians did not taste blood made to flow into the vessel, nor did they pour wine into the vessel. Flórián Mátyás also adds that no other example can be found of the election of a prince, or of a contract within a nation (“constitutional legislation”) besides the Hungarian covenant of blood. Zoltán Terplán lists the doubts that had multiplied since the late 19th century: there is no point in establishing blood relations in such a way between clans of the same nation who are blood relations anyway. Therefore he reaches the conclusion that though the covenant of blood was carried out it was not Hungarians concluding it with Hungarians, rather it was Hungarians reaching an agreement with the princes of the three Kabar tribes who joined them in the conquest. This solution is attractive, but it has a flaw: it cannot be supported by any source.